Mailchimp for Salesforce is an app that you install in your Salesforce account, which syncs data with Mailchimp. Connect the app to quickly pass your sales leads and contacts to Mailchimp, so you can target them with specialized email content. In this article, you'll learn how to connect Mailchimp for Salesforce and set up the application to sync information with your Mailchimp account. Here are some things to know before you connect Mailchimp for Salesforce. Your Mailchimp account will need to have Manager access or higher to complete this integration. To learn more about user levels, check out Manage User Levels in Your Account. This article describes how Mailchimp for Salesforce appears in the Salesforce Classic view. The integration may appear differently when viewed in the Salesforce Lightning Experience. You can switch between Classic and Lightning anytime. Functionality will remain the same regardless of the view you use. Mailchimp for Salesforce requires the Essentials, Enterprise, Unlimited, Force.com, Developer, Performance, or Professional edition of Salesforce. If you use Professional edition, ask your Salesforce Account Executive to enable API access before you install Mailchimp for Salesforce. Mailchimp for Salesforce only allows you to connect your Salesforce account with a single Mailchimp account. To ensure a successful connection, we recommend you complete installation all at once. If you need to complete installation in separate steps, click the App Launcher drop-down menu and choose Mailchimp for Salesforce. Click the MC Setup tab to resume installation. First, you'll need to install the Mailchimp for Salesforce app in your Salesforce account. To install Mailchimp for Salesforce, follow these steps. 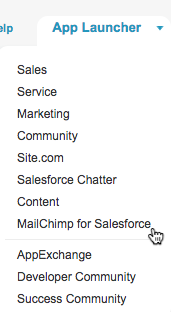 Navigate to the Mailchimp for Salesforce AppExchange listing. On the Confirm Installation Details page, check the box next to I have read and agree to the terms and conditions, and click Confirm and Install. Choose Install for All Users, and click Install. In the Approve Third-Party Access pop-up modal, check the box next to Yes, grant access to these third-party web sites and click Continue. Installation may take a few moments to complete, and Salesforce will notify you by email after it's finished. After you complete installation, you'll be taken to the Mailchimp for Salesforce Install Wizard, where you'll authenticate your Mailchimp account. Not all Mailchimp for Salesforce features are supported by the Salesforce Sandbox. If you choose to use the app in the Salesforce Sandbox, data will not sync properly to Mailchimp. To ensure the app functions as expected, we recommend you Install in production and that you choose the Install for All Users option. Before you can create leads or sync data, you'll need to connect your Mailchimp account to Salesforce. This process is known as authentication. To authenticate your Mailchimp account, follow these steps. Click the MC Setup tab. Input your Mailchimp username and password and click Log In. If you manage multiple Mailchimp accounts, choose the account you want to connect to Salesforce. Now that you've authenticated Mailchimp, you're ready to set up lead creation. Lead creation allows Mailchimp to create Salesforce leads from your Mailchimp subscribers who aren't already Salesforce leads or contacts. To allow Mailchimp to create leads, follow these steps. Check the box next to Allow Mailchimp to create Leads in Salesforce? Click I am Ready to Map Fields. If you don't want to allow lead creation at this time, click I am Ready to Map Fields to move to the next step. If you choose to not to allow lead creation, Mailchimp for Salesforce won't create leads from your existing Mailchimp subscribers. Only subscribers added to your audience after lead creation is enabled will be added as leads in Salesforce. We need you to tell us which Salesforce data fields to map to your Mailchimp audience fields, so that we can be sure to sync information to the correct place. You can choose to map Salesforce fields to your existing Mailchimp audience fields or add additional fields. To map your fields, follow these steps. Click the drop-down menus under Salesforce Lead Field and Salesforce Contact Field to match them to an existing Mailchimp Field. You'll be prompted to map fields for every Mailchimp audience in the connected account. If you don't want to map fields for a particular audience, click Save to move ahead in the process. If you have a contact or lead field that doesn't match one of your existing Mailchimp fields, you can choose to add a new field to your Mailchimp audience. To add a new Mailchimp audience field, follow these steps. Click the Field Type drop-down menu to choose a field type. Check the box next to Field required, if needed. Repeat these steps for each new field you want to add to an audience. After you complete this step, you'll exit the Install Wizard and be taken to the MC Setup page. Here you'll choose sync settings and turn on data sync to share data between Salesforce and Mailchimp. To work with Mailchimp for Salesforce, your Salesforce account users will need to have the right permission set assignments. Mailchimp Users can view Mailchimp data in Salesforce. Mailchimp Admins can view Mailchimp data and use the Query Builder to build queries in Salesforce. We recommend both User and Admin permissions for anyone working with Mailchimp for Salesforce. To edit permission set assignments, follow these steps. Under Administer, click Manage Users. Hover over Permission Set Assignments until the pop-up options appear. Use the Add arrow button to add Mailchimp User and Mailchimp Admin to Enabled Permission Sets. Repeat steps 3-8 for each user in your organization who needs to access Mailchimp for Salesforce features. Mailchimp data can potentially take up a lot of space in your Salesforce account. If you exceed Salesforce data limits, certain Mailchimp for Salesforce features may not function as expected. To prevent this, choose settings to determine which Mailchimp audiences you want to sync, to only sync subscribers from a particular audience, or to limit how long Mailchimp activity is stored in Salesforce. When you choose your sync settings, you can also decide which Mailchimp audiences you want to allow to create leads in Salesforce. To choose sync settings for your audiences, follow these steps. Navigate to the MC Setup page. On the Lists tab, click the Sync Setting drop-down menu to choose an option for each connected audience. Keep Activity settings will sync subscriber activity such as campaign opens, clicks, and sends. The Sync Subscribers Only setting will sync audience and group data for subscribers. After you've chosen your sync settings, turn on data sync to make sure that Mailchimp and Salesforce communicate and share data regularly. You also have the option to allow Mailchimp to create new leads in Salesforce. To turn on data sync and lead creation, follow these steps. Toggle the Data Sync slider to a blue checkmark. If you want to create new Salesforce leads from your Mailchimp subscribers, toggle the slider to a checkmark for Allow Mailchimp to create Leads in Salesforce. When data sync is turned on, Mailchimp audience information like recently added segments and new subscribers will be passed to Salesforce every hour. Mailchimp campaign activity, like opens and clicks, will be updated daily at midnight in Salesforce. To ensure campaign activity is passed to Salesforce, the sync settings for your audience must be set to a Keep Activity setting. An initial data sync may sometimes take a few hours to complete, especially if you a sync a large Mailchimp audience. To check the status of your data sync, visit the Monitor section of your Salesforce account and view Apex or Scheduled Jobs. After Mailchimp for Salesforce is connected, you'll be able to view Mailchimp campaign activity in Salesforce and use the Query Builder to add leads and contacts as subscribers in Mailchimp. You can also choose to customize the application to better manage Mailchimp data in Salesforce and allow other users access to Mailchimp for Salesforce features in your Salesforce account. Use the Mailchimp for Salesforce Query Builder to add leads and contacts to a Mailchimp list, so you can target them with email or ad campaigns. Learn how to disconnect the Mailchimp for Salesforce integration for troubleshooting and other purposes.